Corporate Social Responsibility can be referred to as how companies manage their business processes to produce an overall positive impact on society. But to us, CSR is about more than just business. It is an entire philosophy. We call it: The Greencarrier Spirit. The Greencarrier Spirit influences everything we do, every day, with the aim to act in a sustainable way over the long-term. Our philosophy is spun out of the UN’s Global Compact, which provides guidelines for ethical business based on human rights, employment rights, environmental awareness and anti-corruption. 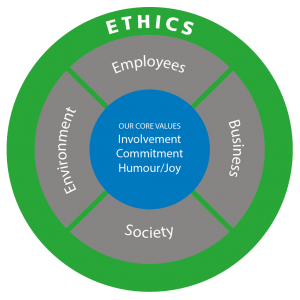 At the very centre of the Greencarrier Spirit, are our core values. They define who we are and what we stand for. What incorporates our spirit is how we do business, how we treat our employees and colleagues, how we see ourselves as a citizen in society and the world around us, and how we contribute to a sustainable future environment. Acting according to the law is obvious to most companies, but acting ethically is not always as obvious. While the law is the key starting point for any business, acting in an ethical way means distinguishing between right and wrong, and then making the right choices. Our ethics underpin the decisions anyone in the Greencarrier Group makes. We believe that working as an ethical business attracts and retains customers, investors and employees. We embrace employees that want more from their employer than just a paycheck. We believe that being proud of what you do, having a purpose at work and being part of a company with values that match your own, are legitimate employee demands. We take pride in our staff and always strive to be a good employer. By investing in our staff’s well-being and development, we secure qualified, highly motivated staff that can help us become an even more positive and successful company. By doing business according to ethical, professional and legal standards, we are a fair and honest business partner. We want to be a responsible corporate citizen, and we believe that by caring for the world around us and the people in it, we become a better business partner and employer. We take our role as a corporate citizen seriously, being involved in several CSR projects, both locally and globally. Our policy is to promote positive development in activities such as education, healthcare and sports. Our projects include a wide range of sponsorships as well as personal engagement covering children’s rights and saving our world ocean to supporting sports activities. The impact of transportation on the environment is inherently negative. That is why it is especially important for us to focus on the environment and make our very best effort to minimise our ecological footprint. Environmental protection is therefore always on top of our agenda and part of our long-term strategy. Our ambition is to always apply the best environmental practice in everything we do, and many of our CSR projects are focused especially on the environment. The project should focus on the environment. The project should be related to our business. The project should involve a long-term commitment. The project should have a connection to the local countries where we are present. The project should enable that we can be involved and not just donate money. If the project involves supporting an organisation, we should be able to ensure that the money is used correctly. Click here to see the CSR projects our hearts pound a little extra for.